NFM Rollout: The research in this theme aims to observe and document experiences of countries during the rollout of the NFM. An Analysis of Fund Allocations under the NFM will be carried out. The Roles of Different Actors will be critiqued and their input in the country dialogue process analyzed. We will follow countries as they develop their concept notes and provide models and recommendations on NFM Concept Note Development. 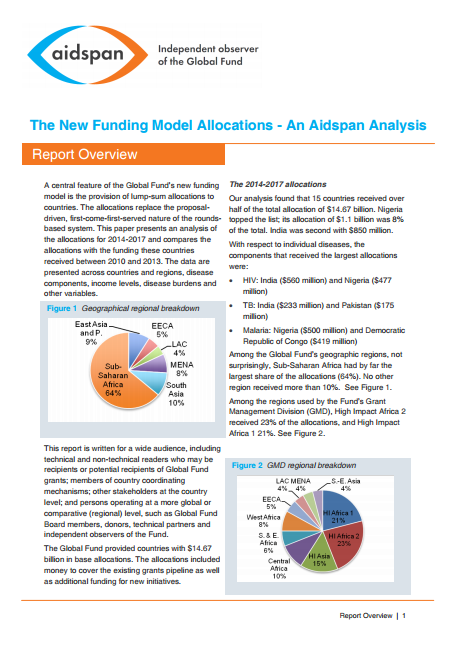 With most Global Fund recipients having young populations who are affected by HIV, malaria and TB, Aidspan will investigate existing gaps and recommend how Child Focused Programming can be integrated into programs under the NFM.